Maria Boox is passionate about yoga and has been practising and teaching for over thirty years. She is in fact a pioneer as she opened one of the first yoga shalas in Sweden. Yogashala Stockholm was Maria’s home for ten years and many of the teachers in Stockholm and around Sweden have studied with and learnt from her. Maria now teaches yoga independently worldwide. 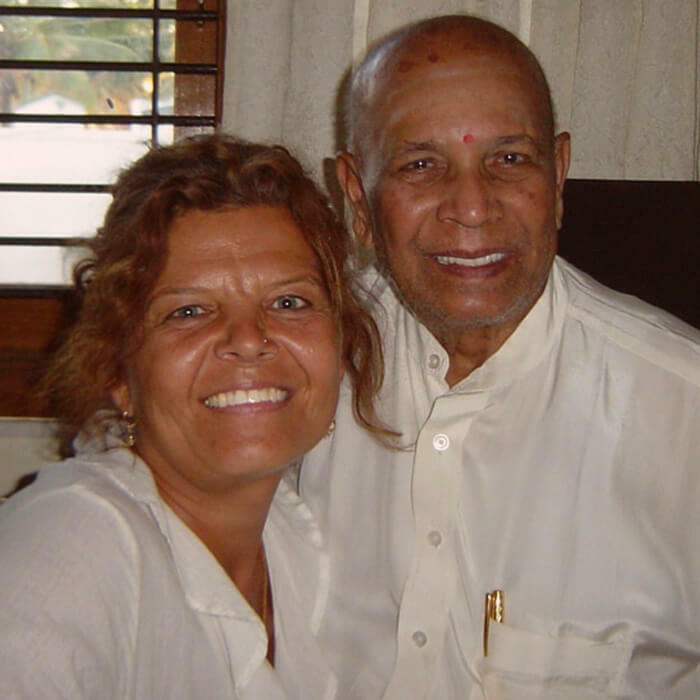 Maria is an original student of her beloved Guruji, Pattabhi Jois, who she studied with for thirteen years. She has been authorised level two directly by Guruji, and also by Sharath. Maria is well established in the Ashtanga yoga tradition and pursues her studies in the lineage of Guruji, Sharath and other teachers. She is also certified by BKS Iyengar, studies philosophy with Ramesh Balsekar and has been certified to teach pranayama by Shri O.P. Tiwariji. All these experiences, education and studies with so many masters in yoga, combined with her caring and warm personality, allows Maria a unique and personal way of teaching yoga. Her understanding and teaching of pranayama and Patanjali’s Yoga Sutras provides a depth to Maria’s approach to teaching and to her whole practice. Yoga philosophy is very dear to Maria and is always a part of her life and her teachings. In addition, Maria has deep knowledge of the Ayurveda tradition. Maria teaches both led Ashtanga classes and ‘Mysore-style’ Ashtanga in the tradition of Shri K Pattabhi Jois (Guruji). Her aim is to follow what Guruji taught her during the thirteen years she studied with him. In addition, Maria teaches Hatha yoga classes where she builds up different sequences of asanas according to the theme of the class and the people in the group. Maria is always mindful of individual needs and teaches according to the needs of each student.